Thierry Lequeux was graduted from the University of Orsay (Parsi XI). He obtained his PhD in 1994, under the supervison of Dr Jean-Pierre Bégué and Dr Danièle Bonnet-Delpon on the study of the role of the CF­3 group in cycloaddition reactions. 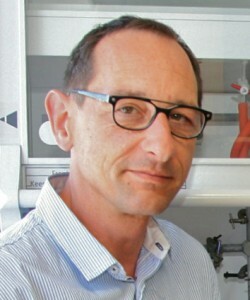 After a post-doctoral position in the group of Pr Jonathan Percy at the University of Birmingham (UK) on synthesis of difluoromethylphosphonates as analogues of phosphates (3′-modified nucleotides), he was appointed Lecturer in fluorine chemistry, and then full Professor at the University of Caen (France). His current research interests are focus on the preparation of fluorinated biomolecules, and biopolymers to prepare acyclonucleosides, enzyme inhibitors and fluorinated polymers for tissue engineering. He is member of the GIS Fluor, the French Fluorine Network . Teaching in organic synthesis, retro-synthesis, heterocyclic chemistry, fluorine chemistry, insecticides, and molecular orbital going from L2 level up to M2 level. Fluorophosphonylated Monomers for Dental Applications Mathieu Derbanne, Anais Zulauf, Stéphane LeGoff, Emmanuel Pfund, Michael Sadoun, Thi-Nhan Pham, and Thierry Lequeux. Org. Process. Res. Dev. 2014, 18, 1010-1019. 1. « General Methods for the Synthesis of Difluoromethylenephosphonates » T. Lequeux in Fluorine-Containing Synthons – ACS Symposium Series N°911, V. A. Soloshonok Editor- Oxford University Press/ American Chemical Society, Washington DC . 2005, Chapter 26, pp 440-455. 2. Syntheses of Monofluoroalkyl compounds by substitution reactions, T. Lequeux – Houben-Weyl, Science of Synthesis, volume 34 Compounds with One Carbon-Heteroatom Bond: Fluorine, Editeurs S. Ley, J. M. Percy, 2006, chapitre 34-1-4-1 pages: 57-70. 3. Syntheses of Monofluoroalkyl compounds by substitution reactions, T. Lequeux – Houben-Weyl, Science of Synthesis, volume 34 Compounds with One Carbon-Heteroatom Bond: Fluorine, Editeurs S. Ley, J. M. Percy, 2006, chapitre 34-1-4-3, pages: 149-168. 6. Straightforward Synthesis of Monofluoroalkenes, F. Larnaud, T. Lequeux, Chemistry Today 2012 (vulgarisation scientifique). 1. Preparation of monofluoroalkenes via a direct olefin formation from carbonyl compounds and metalated fluoro-heterocyclic sulfones. Pazenok, S., Demoute, J.P., Zard, S., T. Lequeux 2002, PCT Int. Appl. WO 0240459 A1. 3. Utilisation de dérivés de monomères issus de l’isosorbide comme substitut des dérivés du bis-phénol A- H. Ho, T. Lequeux, N. Pham, G. Ely, G. Sotto – G-Pharma/CNRS 29/07/2016, FR3031976 A1.